If an Amazon SQS policy doesn't directly apply to a request, the request results in a default-deny. For example, if a user requests permission to use Amazon SQS but the only policy that applies to the user can use DynamoDB, the requests results in a default-deny. If a condition in a statement isn't met, the request results in a default-deny. If all conditions in a statement are met, the request results in either an allow or an explicit-deny based on the value of the effect element of the policy. Policies don't specify what to do if a condition isn't met, so the default result in this case is a default-deny. For example, you want to prevent requests that come from Antarctica. 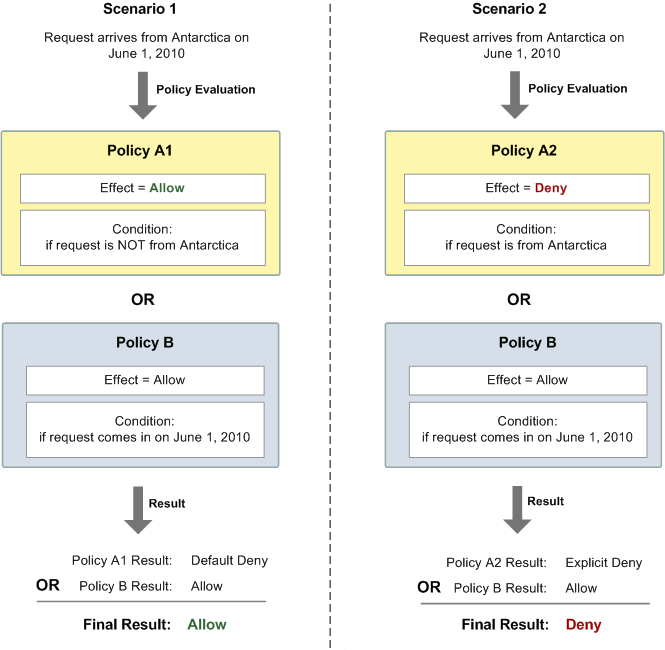 You write Policy A1 that allows a request only if it doesn't come from Antarctica. The following diagram illustrates the Amazon SQS policy. If a user sends a request from the U.S., the condition is met (the request isn't from Antarctica), and the request results in an allow. However, if a user sends a request from Antarctica, the condition isn't met and the request defaults to a default-deny. You can change the result to an explicit-deny by writing Policy A2 that explicitly denies a request if it comes from Antarctica. The following diagram illustrates the policy. If a user sends a request from Antarctica, the condition is met and the request results in an explicit-deny. The distinction between a default-deny and an explicit-deny is important because an allow can overwrite the former but not the latter. For example, Policy B allows requests if they arrive on June 1, 2010. The following diagram compares combining this policy with Policy A1 and Policy A2. In Scenario 1, Policy A1 results in a default-deny and Policy B results in an allo because the policy allows requests that come in on June 1, 2010. The allow from Policy B overrides the default-deny from Policy A1, and the request is allowed. In Scenario 2, Policy B2 results in an explicit-deny and Policy B results in an allow. The explicit-deny from Policy A2 overrides the allow from Policy B, and the request is denied.